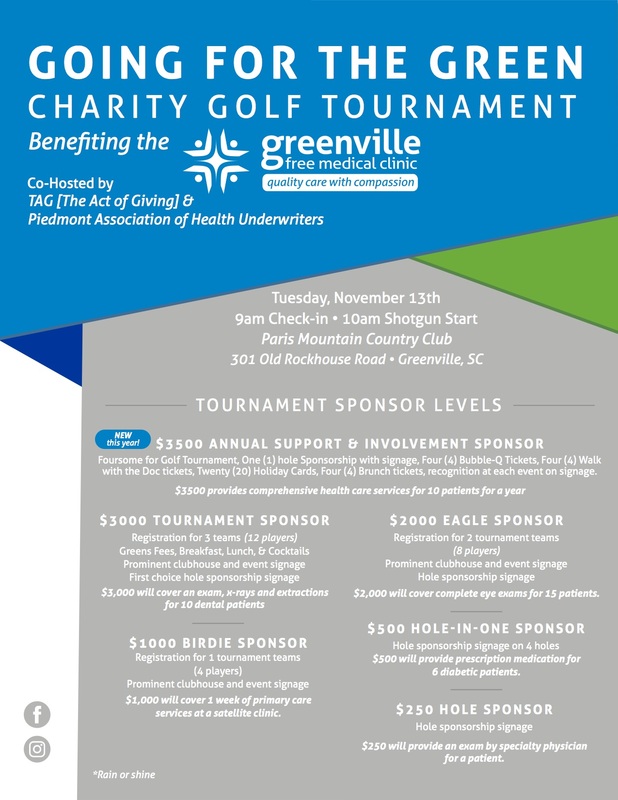 It is with great excitement we announce our involvement this year with The Greenville Free Medical Clinic’s annual golf tournament. We will be co-hosting alongside TAG: The Act of Giving, a partner of The Free Medical Clinic. We are actively seeking players and sponsors for our “Going for the Green” Charity Golf Tournament to be held on November 13, 2018 at a new venue this year, Paris Mountain Country Club. 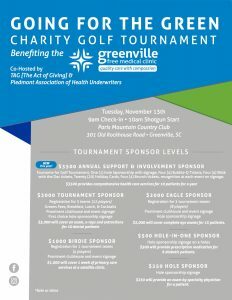 By playing, or sponsoring a team in the Tournament, not only will you be supporting The Greenville Free Medical Clinic, but also our community. For 30 years the team at GFMC has provided thousands of patients with quality healthcare, completely free of charge. With the help of volunteers like you, we oﬀer medical and dental services, ophthalmological care, as well as prescription medications to hundreds of our established patients and up to 20 new patients every week. Please consider playing ($75 per player) putting together a team ($300) or by becoming a sponsor. Click here for registration forms, as well as sponsorship information. Most importantly this tournament is about participation and raising awareness about what we do here at the clinic, so please forward this email and attachment to any friends or colleagues you think may be interested! Please let me or Jay Holloway know if you would like to participate this year! We look forward to helping this wonderful cause once again! Jay can be reached at jay.holloway@bluechoicesc.com or 803-361-6387.